After Theresa May shocked the country with a snap general election, election talk is dominating the news (at the disappointment of some). However, it’s not just the general election on June 8th that will change the politics of the UK. Today some of us will be electing local counclilors and in big cities like Bristol and Manchester, new Mayors are being elected too. Although they get less media attention than the General Election, today’s mayoral elections have the potential to have a really big impact on day-to-day life in the areas they cover. Unlike the ceremonial Lord Mayors, the new metropolitan mayors being voted for will have genuine powers over local issues. They could have a big impact in areas such as transport, housing, and planning, and will have been voted in to power by millions. The good news for us is that that the new metro mayors for Manchester and Liverpool will have a remit over areas where fracking license blocks have been offered for sale. The bookies favourite to win in Manchester, Andy Burnham, pledged last year that he would recommend a presumption against fracking across Greater Manchester if he becomes mayor. However, as of two weeks ago, none of the other main candidates in either region had made a similar pledge. This is important because, whilst Westminster was quite happy to overrule the local council and grant Cuadrilla a license to frack in Lancashire, it will be much harder for central government to overrule the new mayors. These mayors form a major part of the government’s pledge to “put communities in control”. If the new mayors that they have championed decide that they don’t want fracking, it will be incredibly embarrassing for the government to undermine their authority. So, Greenpeace got in contact with each candidate from the main political parties in Liverpool and Manchester to ask them to clarify their position on fracking. If they didn’t respond or wouldn’t make a commitment, we let them know to expect to hear from lots of Greenpeace supporters from their area. 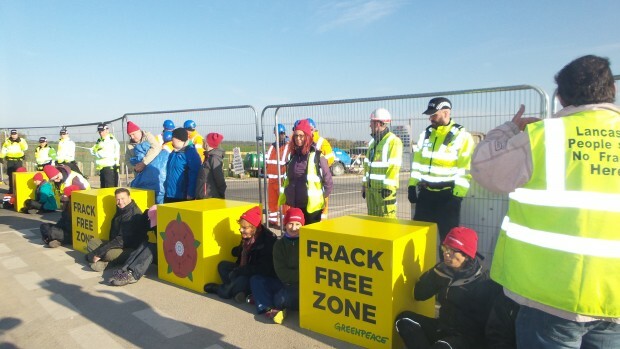 In Manchester, this tactic worked really well, and the Tory and Liberal Democrat candidates joined Labour and the Greens in pledging to stand against fracking. This is really great news, as it means that whoever is voted in as Mayor of Manchester on 4th May has publicly committed to stand against fracking. A public pledge like this would be embarassing to go back on, and could be a vote loser the next time around. Unfortunately, none of the candidates for Mayor of Liverpool responded to our initial enquiry, so to pile on the pressure Greenpeace supporters from the Liverpool region sent over 1,200 emails to each of the main candidates for the mayoral election, and also sent hundreds of tweets. This people pressure worked. Within just a couple of days of our supporters contacting the mayoral hopefuls, both the Green and Liberal Democrat candidates had pledged their commitment to stand against fracking in Liverpool. However, we’ve yet to hear from the Labour candidate, Steve Rotheram, or the Conservative candidate Tony Caldeira. Let’s hope they speak up soon enough and with those that already have, let’s make sure they keep their promises to oppose fracking. Together we can keep areas like Manchester and Liverpool safe from fracking. If you’re keen to learn more about lobbying your local MP or council, take a look at this blog from Greenpeace’s Senior Political Advisor Rosie Rogers on how to lobby your local MP. Or, if you want other ways to help stop fracking, here’s five ways you can help play your part in the fight against fracking. Microbeads consultation: the good, the bad, & the ??? From L’Oreal to Revlon, which brands are polluting the ocean with microbeads? Microbeads – the story so far….